Good morning and happy Sunday to ya. In the tradition of our Sunday posts we're gonna ride the soul train to gospel town again. So, let's call it 'Sanctified Sunday' and get down to business. 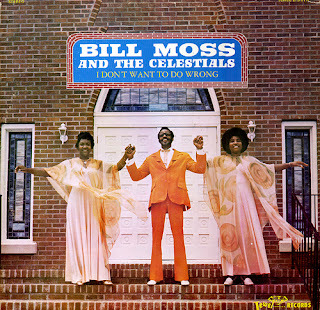 Bill Moss is an artist that bounced back and forth from commercial efforts to gospel recordings throughout his career. Some of his early 45's were some of my first coveted rare groove records. He was founder of the Capsoul label which provided me with many of my favorites. 'Sock It To 'Em Soul Brother', 'Number One', and my personal favorite from that label 'Hot Grits' by Elijah & The Ebonites are heavy percussive funk treats. Bill was married to Essie Moss and they started The Celestials, very much in the direction of the Staple Singers. This song, 'Keep On Using Me Jesus' is very much in a Staples vein. Bill is also related to one of the most well known soul/gospel groups The Clark Sisters. Mr. Moss died at the age of 76 from emphysema but before he passed he was inducted in the Gospel Music Hall Of Fame in 2004. Cheers, Bill we love you here at Soundboutique and your funky break embedded song is perfect for this day. Hoping I'm ushering out this cold or flu or whatever the heck it is, and this song has got me singing my own version...Keep On Healing Me Jesus!